Have I Mentioned I love VACATION!? 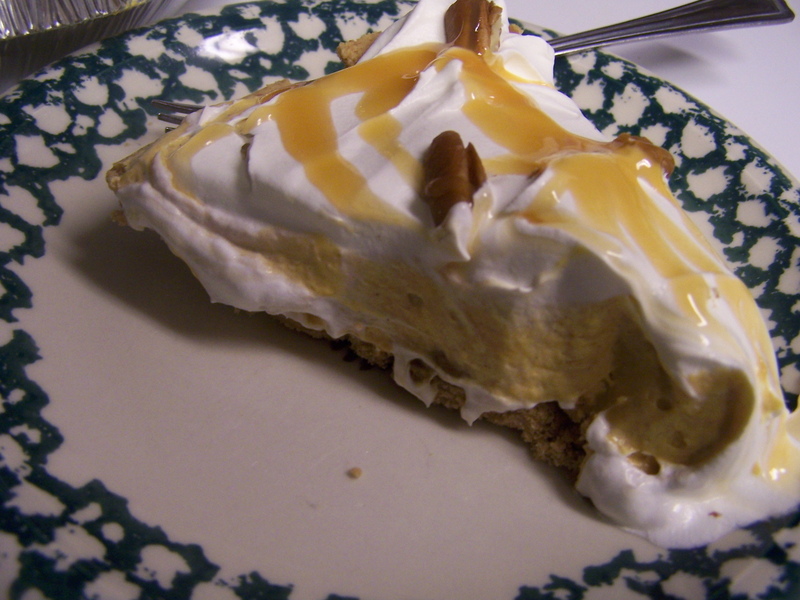 Late yesterday afternoon I made Turtle Pumpkin Pie. Oh yes, it is good. Today, I got up about the time I would normally be arriving at work. Drank some coffee, actually took a shower and dressed. 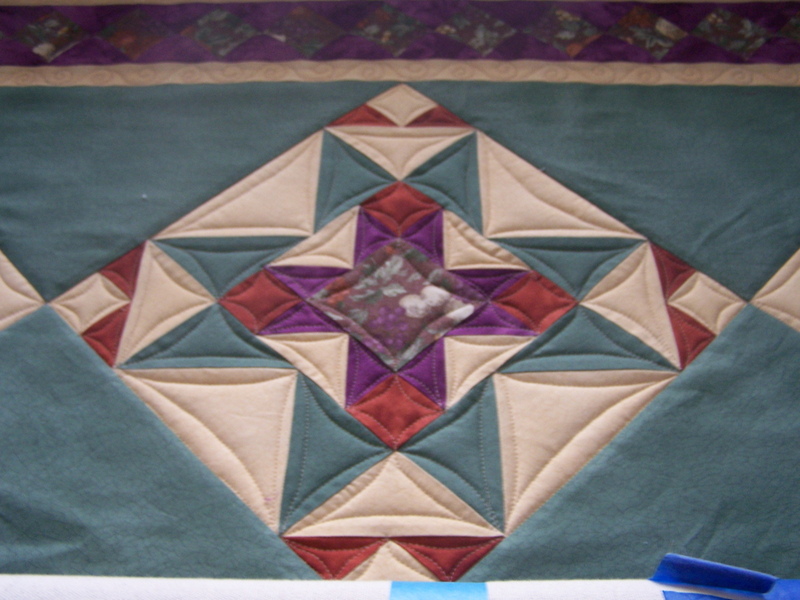 Then I loaded a customer quilt and got started. The customer does not like this top. 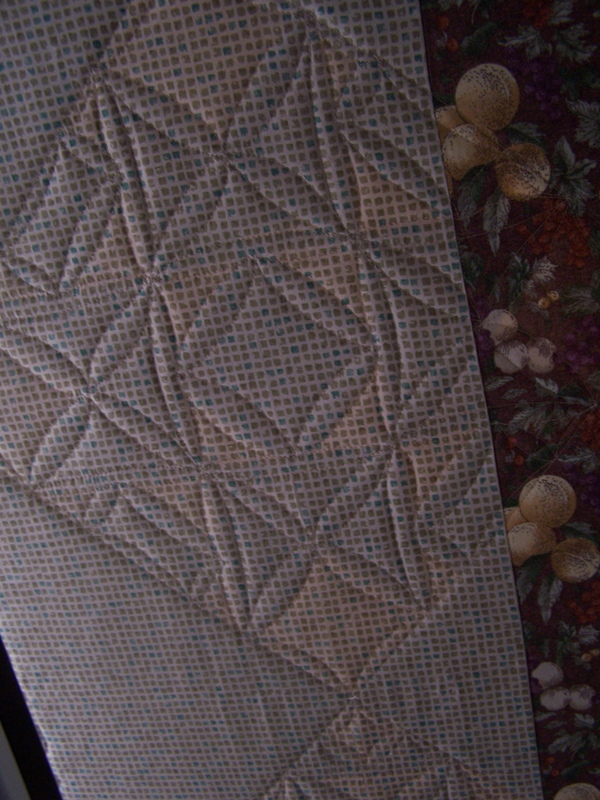 I hope she likes the quilt when I get finished with it. I was going to use a template to do all the CC (continuous curve). But after the first block, my attitude regarding using a template for all that CC was “screw that!”, and went back to freehanding it all. Sure it’s not perfect…but I think it looks pretty good. Goes lots faster, too! I think the back is going to look really cool. After working on this for 4 hours, I decided it was time to go back to holiday baking. 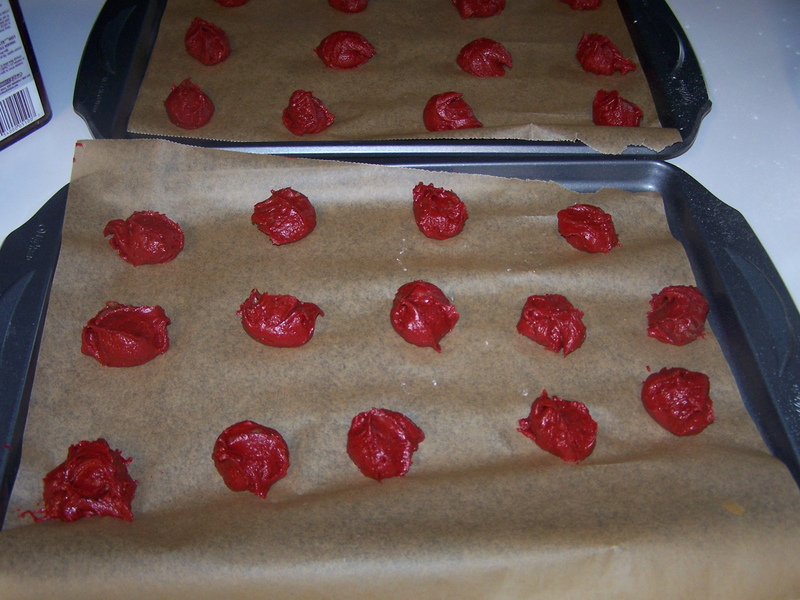 I am trying to make Red Velvet Whoopie pies for my son. I have no idea if these will be good or not. Never made them before, but he loves Red Velvet cake. I’ll let ya know how they turn out in a later post. Which brings me to a newsflash I have not yet shared with you! Santa came early at my house. He brought me this mixer! 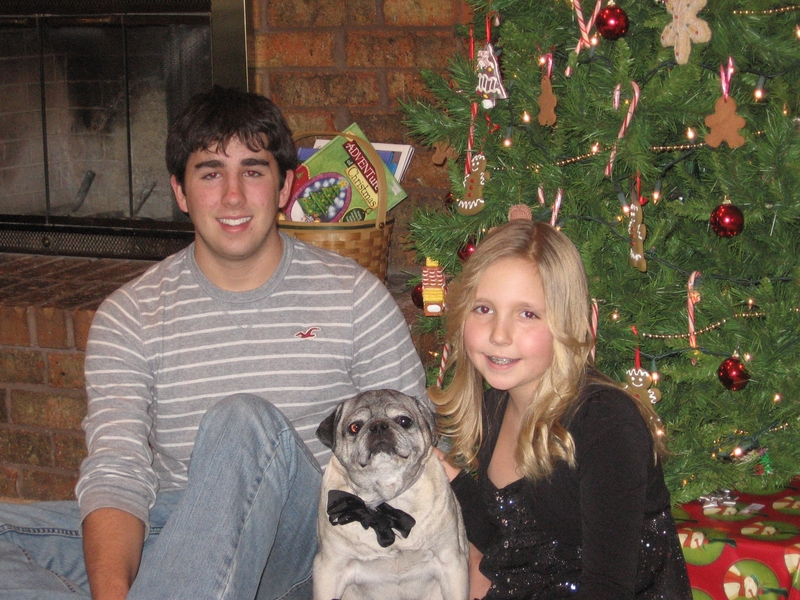 And speaking of my son, this is the picture from the Christmas cards his dad & stepmom did this year. Derek and his little sister…aren’t they cute? Well, if you are still reading at this point, I hope you are having a great week! That turtle pumpkin pie sure looks good Randi. 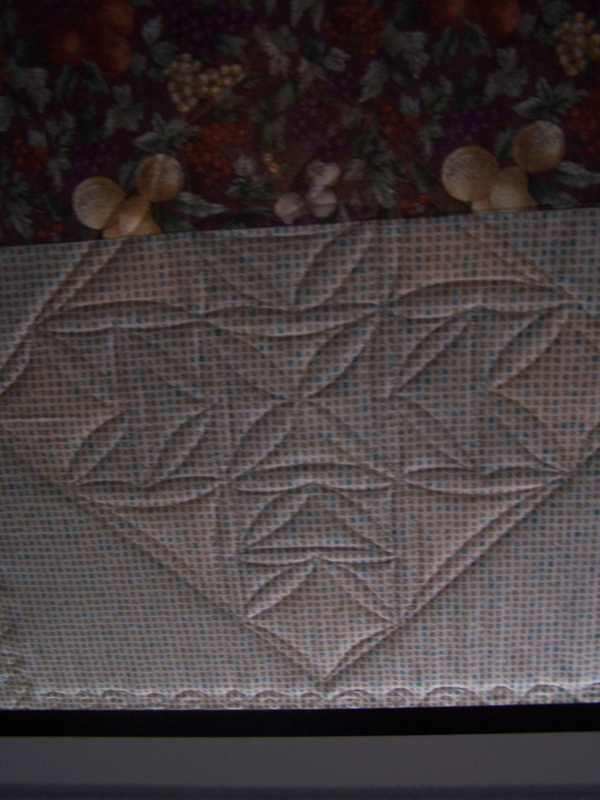 I love what you are doing on the quilt. It looks great. The mixer is awesome. Keep on enjoying your vacation. I have made a Pie close to that one before! (I hate pumpkin but i make it for every else!) I added a thin layer of chocolate right over the pumpkin, that way when you took a bite you got a little bit of a crispy snap to add some texture! Your CC looks great! Mine aren’t perfect either, but if I had to use a template to do them they would be waaaay more expensive! Perfect is over-rated! 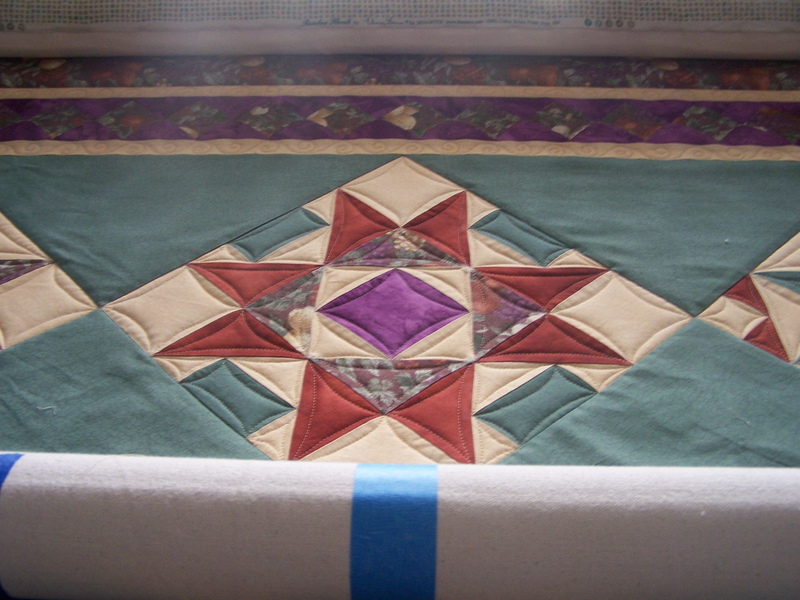 I absolutely love the quilting you are doing – it is perfect. Great job!! Wish I had some of that turtle pie. I’ve never had any and now I want some. I made that exact pie for Thanksgiving!! It is yummy. 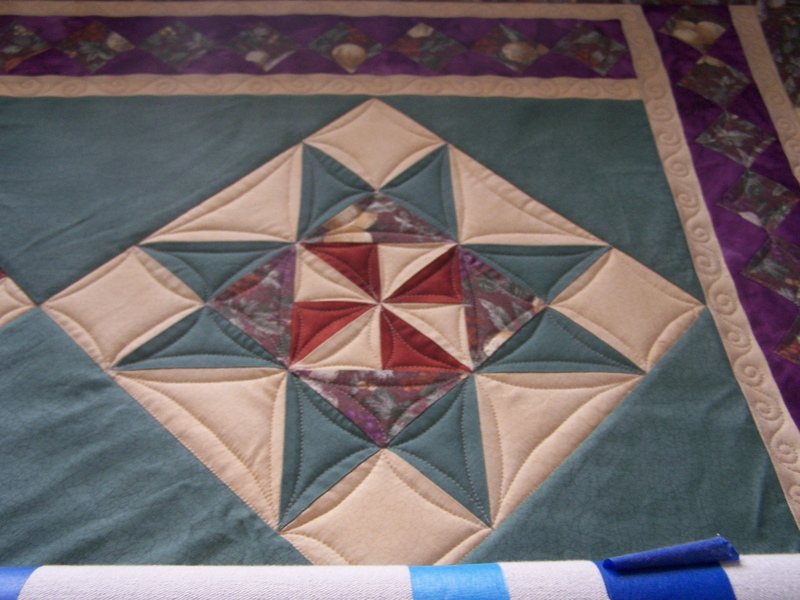 The quilt is looking fabulous Randi…and your right, ‘cc’ is much faster freehand and yours looks great! The baking looks awfully tempting too…have a great christmas! Grrrrrrrrreat picture of Derek and his sister. 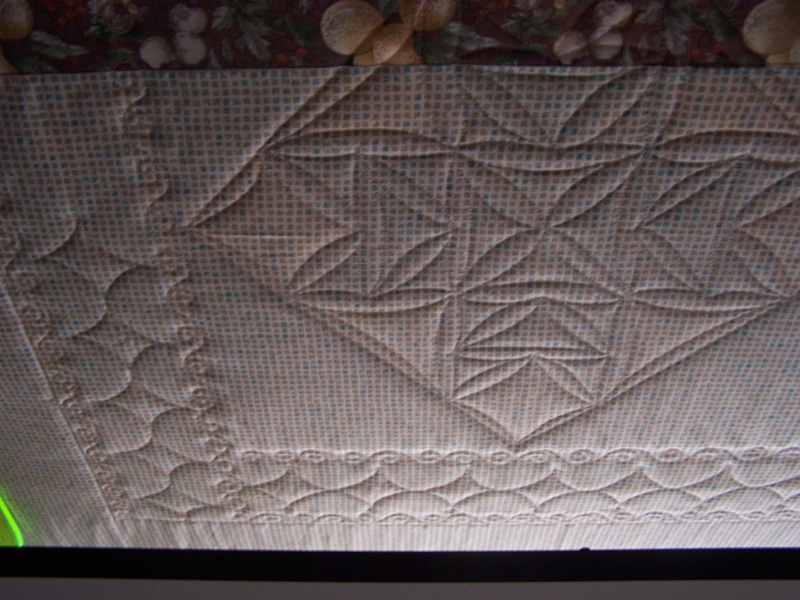 I have to admit I’m not a great “messer” with traditional things …. so pumpkin pie (straight) is my favorite. Your CC looks terrific and I’m with Terri … perfect IS overrated. Enjoy the rest of your vacation and I’m wishing you and yours the very merriest Christmas! God bless you. 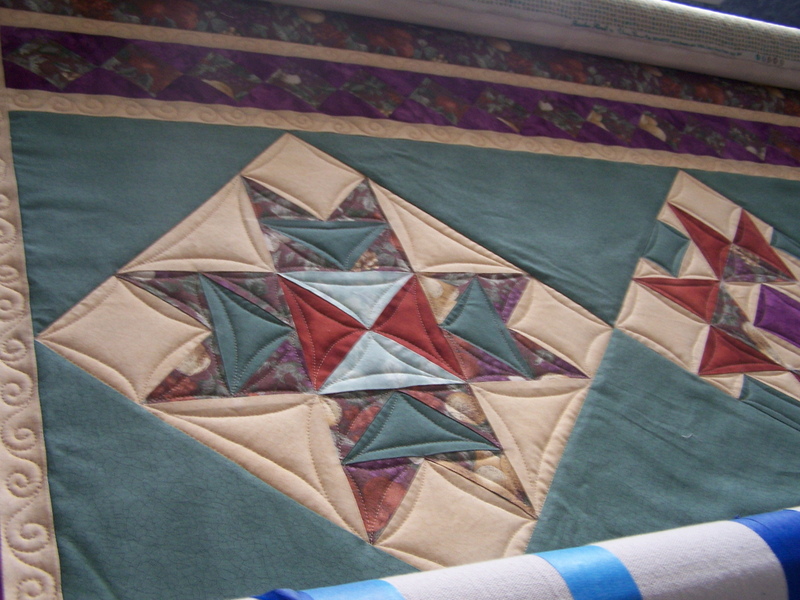 Lovely quilting, and I am glad to hear that you are enjoying your vacation! And the desserts look absolutely YUMMY – and that red mixer is to die for! 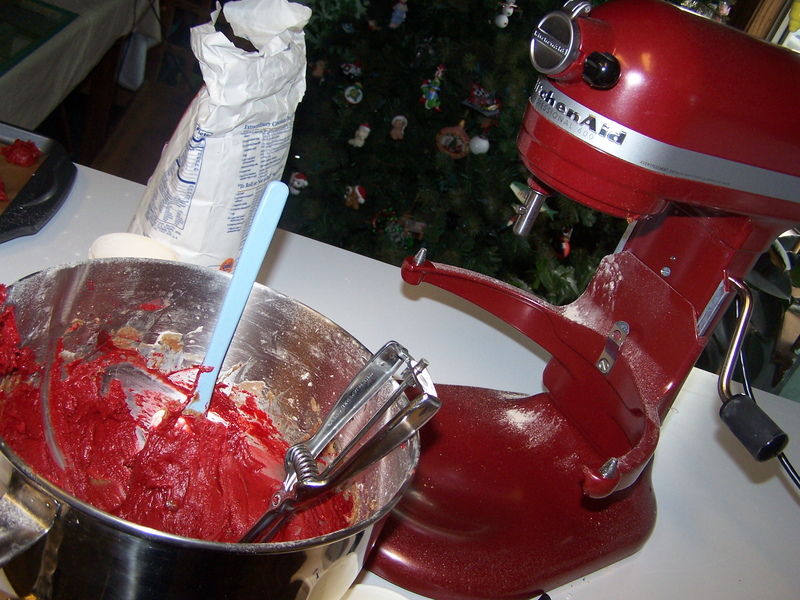 I have been secretly wishing for that mixer since I saw the “red” color. 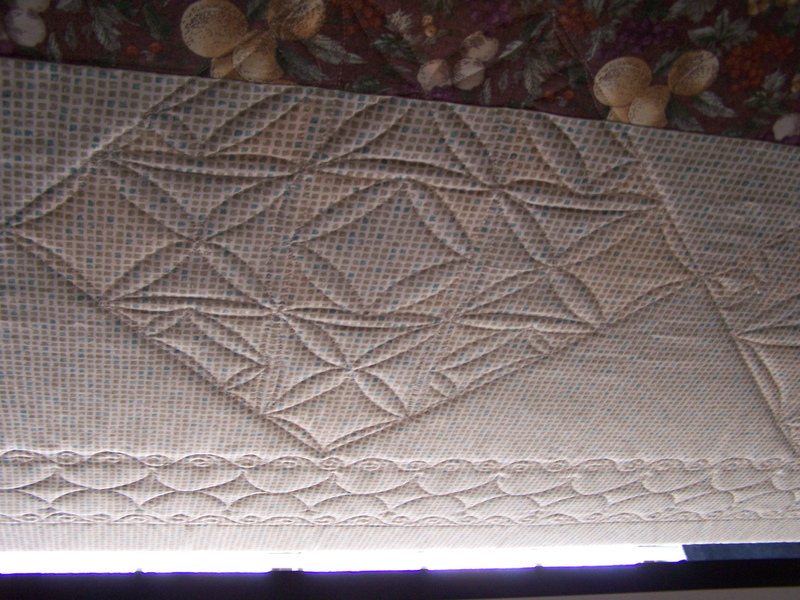 Love it…but I have my grandma’s mixer and DH thinks that is “good enough”. It’s only something like 75 years old! i laughed right out loud at your “screw that” comment — my opinion exactly. it looks perfect enough to me, so keep on keeping on! I agree with Suzanne. You are rocking that CC anyway. Looks great. Pumpkin and chocolate??? What the? Now, what is that on top? We have pumpkin as a vegetable – baked, mashed, yum. 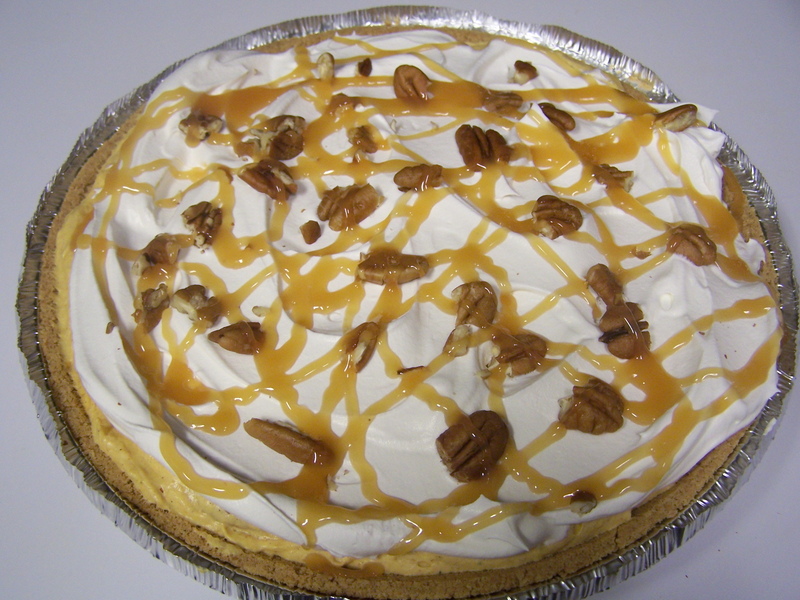 The thought of having it in a pie as a dessert intrigues me. Can you direct me to a recipe, please. I mighr just give it a go. I love pumpkin. Oh, and I got a KitchenAid for my birthday this year. I love it. Your pie looks so yummy, and I’ve never heard of whoopie balls? Love you’re red mixer! I’ve always wanted one but settled for a sunbeam, I wore one out and at the rate I’m going these days this one will probably go to my grandchildren lol. Your CC looks great! 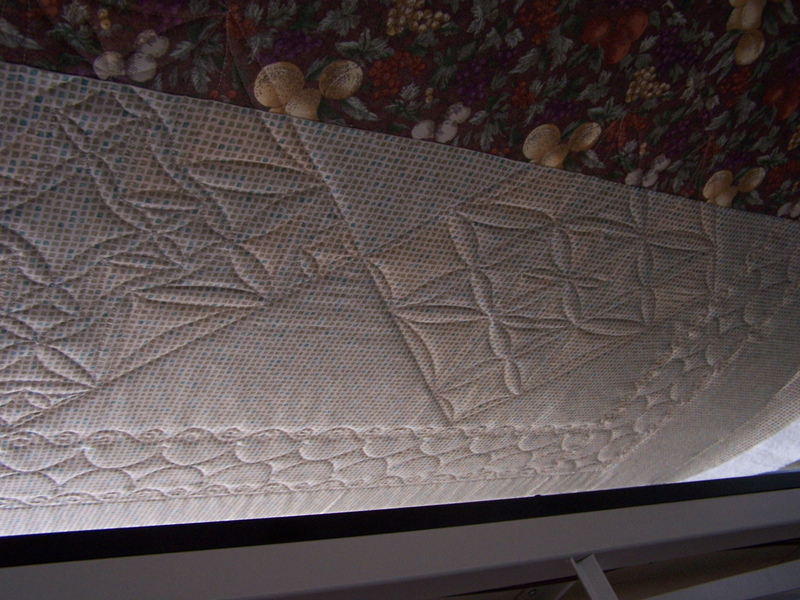 have you ever noticed that once a quilt is washed any little wobble in the quilting disappears, esp when you’re not 10 inches away from it?? I’d better get ready for work. Have a great day! Love the early Christmas present, mine has been busy today as well. I am interested to find out how the whoopie pies turn out….we have a Dutch Farmer’s Market (Amish/Mennonite) nearby and they do a red velvet whoopie pie, I haven’t tried it though.